Table fans are perhaps one of the excellent options for enhanced comfort during the summer season. The High-speed table fans, also known as the air circulators help you use it anywhere at your home and do not suffer from the issues faced by the ceiling fans that may have a few non-reachable regions inside the room. Table fans, over the years, have gone through a huge development and have been offering improved features. 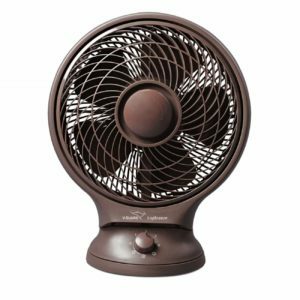 Let us check out the top five high-speed table fans in India that you can buy and also guide you on how to buy the best fan that meets your needs. 4 Why go with a Table Fan? Ideally, table fans come with variable speed controls. The standard configuration would be two to five different speeds. There are also fans with a single speed, and they may not be a good option if you are using them for cooling purposes. The single speed table fans are best suited for the dedicated purposes. The speed of the fan should have a greater bearing on its ability to cool the surrounding air. Normally measured in RPM or revolutions per minute, it represents the rotations that the motor makes in a minute. The more RPM rating will translate into a better flow of air. The Air delivery of the fan is measured in CMM (Cubic Meters per Minute). CMM measure the conversion of electrical energy into the moving air. Higher the CMM, more would the air flow that would come out. The table fan is bound to get dirty over time. The blades accumulate dust and other impurities. If your new table fan has the removable grill, it will be easy to clean them as soon as they get dirty. While most of the table fans come with a removable grill, a few of them may have screws which may not be a good idea. Fans are rated based on the amount of air that they are able to move. Usually, the measurement is concerning CFM or cubic feet per meter. However, this rating may not be practical for the domestic fans, which are rated based on the input power rating. For the practical purposes, the power of your fan should be around 45 to 80 Watts. Most of the table fans are made available in plastic. However, there may be a few that have a metallic construction for some parts. The plastic build can be helpful in making it lightweight. If you are looking for light weigh functionality and ease of cleaning, plastic can be a good option. 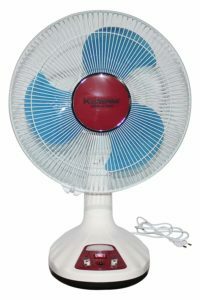 Now that you know what you should ahead for in your table fan, let us check out the best high-speed table fans in India. 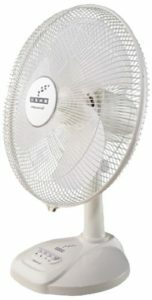 Usha Maxx Air 400mm Table Fan is definitely one of the best high speed table fans in India that provides you with amazing features with high performance and at an affordable price. The fan comes with a four speed control system. The Reservoir lubrication system is what will make it a great choice. The powerful motor and aerodynamical design are the features that make it a great high speed for your needs. The fan comes with a 55 Watts power performance. The fan offers a jerk-free and uniform oscillation functionality. The fan comes with semi-transparent blades and offers you a 1280 RPM performance. Also, the air delivery is 85CMM which can be considered pretty good. The appealing design making an excellent option. It offers you a good airflow even at low voltage. The assembly dismantling is not as easy. Entirely made of plastic (but thus, it is lightweight). Q: Can it be operated for prolonged hours? A: Yes, it can be used for ten hours at a stretch. Q: What is the warranty for the product? A: The product has one year warranty. 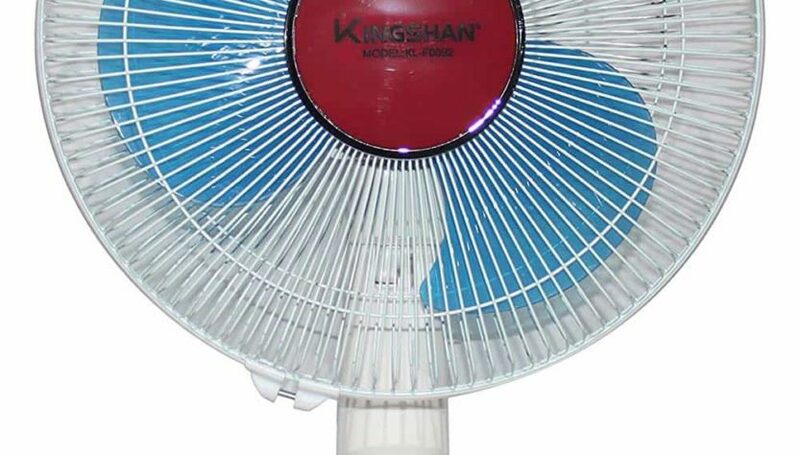 The Kingshan Rechargeable Table Fan is perhaps one of the formidable choices, thanks to its rechargeable functionality. You can use it anywhere you would want to, including outdoors once you fully charge it to its capacity. The battery capacity reads 7000 mAh and the initial charge needed on opening the box for the first time would be around 20 hours. The motor comes with a 24 Watt power motor and offers you a speed of 1450 RPM making it one of the best rechargeable table fans in India. The fan comes with an LED indicator for letting you know the charge status. It offers you a three speed control variation options. Good battery backup – the backup offered is around two to three hours. It can be used for both AC and DC power supply. It also comes with a nigh LED lamp feature. Over the years, battery backup might reduce. Q: What is the size of the fan? Q: Does the fan oscillate? A: Yes, it comes with the oscillating mechanism. 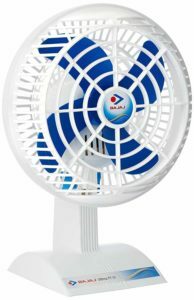 The Bajaj Ultima PT01 200mm Table Fan should be one of the best options if you are looking for a table fan under INR 1000 and the one with an excellent feature set. Though smaller in size, the fan comes with a contemporary look and one of the best table fans for bedrooms. It has an adjustable setting to let you enjoy the cooling effect based on your personal preferences. The 48 Watt fan comes with a speed of 2300 RPM and offers you an air delivery of 50 CMM. The four leaf ABS blades are durable enough and provide the much needed light weight for the product. The clasp grill is the best option for ensuring a better dismantling and cleaning. The spiral mesh offers you a better look that makes the fan elegant in terms of looks. Compact and light weight design for the portability. The fan cannot be hung on the wall. Q: Does the fan come with oscillation functionality? A: No, it does not have oscillation functionality. A: It weighs 1.5 kg. V-Guard Personal Fan Lap Breeze is yet another smaller option for the high speed table fan, but it offers you an excellent function and features. In fact, the fan is designed for use by a single person. The sweep size of 250 mm is ideal for the purpose for which the fan has been designed for. One of the best case scenarios that the fan would suit well is the congested spaces where a regular sized fan may be a liability. It also offers you an up and down movement functionality as well. It also comes with an oscillating feature and works with the 40 Watt power motor. The 1250 RPM speed makes it one of the formidable choices for the best high speed performance. You have access to a three speed variation options. A sturdy and durable build quality. Oscillation functionality along with vertical movement. The air delivery is a little low – 25CMM. A little heavy and portability is adversely affected. Q: What is the height of the fan? A: The height of the fan reads 16 inches. Q: Can it be mounted on the wall? A: It cannot be mounted on the wall. The Usha Duos Mist Air 400mm Table Fan is a perfect combination of performance and style. The fan has aerodynamically designed 3 PP blades and offers you an efficient delivery of air. The low noise operation would make it a great choice for those who want to have a sound sleep. The fan comes with a three speed settings. The design is compact and light weight and makes it one of the prime options for portability. The 1280 RPM motor, 60 CMM and the 400 mm sweep should meet the needs of an average sized room. The oscillation offered is jerk free and smoother. The tilting mechanism is also quite handy and smoother in operation. Easy to use and dismantle for cleaning. The blade is slightly thick, and this affects air flow. A: The fan comes with a two year warranty. A: It is a 16 inches fan. The safety precautions that need attention for the pedestal fans and table fans would be almost similar and equivalent. They can fall off from the surface that they have been kept on. Make sure that the surface on which the fan is kept is flat enough. Ensure that the wires and cables are not tangling anywhere and they are tucked away. Fan blades when rotating can be rather risky as they move at higher speeds. Pets or children can put their fingers into the grill and get their fingers damaged. If you are wearing loose clothes, avoid standing too close to the fan as the air flow can pull the clothes inside it. You will also need to take care if you are a woman and drying your wet hair in front of the table fan. There are have several cases of the hair being pulled in and causing death. Why go with a Table Fan? Of course, ceiling fans have been one of the best options for cooling your rooms. But, there are areas where a ceiling fan may not be a good option. And then there are other considerations like the durability, affordability, and availability of multiple sizes and shapes. Some of these factors can make it necessary to opt for table fans instead of ceiling fans. Versatility and ability to be used even in congested spaces is what would make the table fans a preferred option in comparison to the ceiling fans. A few of the versatile functions that the fan comes handy with would include drying the floor or any similar watered area and cooling the room or even drying clothes. 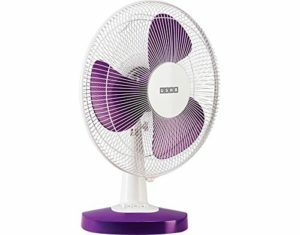 That was a formidable list of the best high speed table fans in India you can buy online. Of course, there are several options available for the best table fans, but we have focussed on the best brands that offer an exceptional performance in compiling this list. We have paid attention to the needs of the consumers when including the products in our top five picks. The compilation also includes the table fans that offer rechargeable battery option as well. We assume this list of the top five table fans meets your needs to the best possible standard. Have you used any of them? Or do you have any other good table fan in your mind? If yes, then please do share your thoughts and experiences about the best high speed table fan in India, in the comments below.